The Grill at Iron City Serves Up Some Impressive Dishes! For our first dinner of Winter Restaurant Week, we headed over to The Grill at Iron City. Coincidently, we just did an interview with The Molly Ringwald's Band in which they raved about how much they look forward to the food when playing a show at Iron City. It's nice to know that when amazing acts like Pentatonix, Jason Mraz, and others come to town, they are met with the incredible food that The Grill at Iron City creates! The first thing we noticed is that the #WRW2017 menus have a LOT of amazing options! They have both a Lunch and a Dinner menu. We struggled to decide on which items to try, but were definitely pleased by what we went with. The fact that you get to choose an appetizer, entree, and a dessert is great. 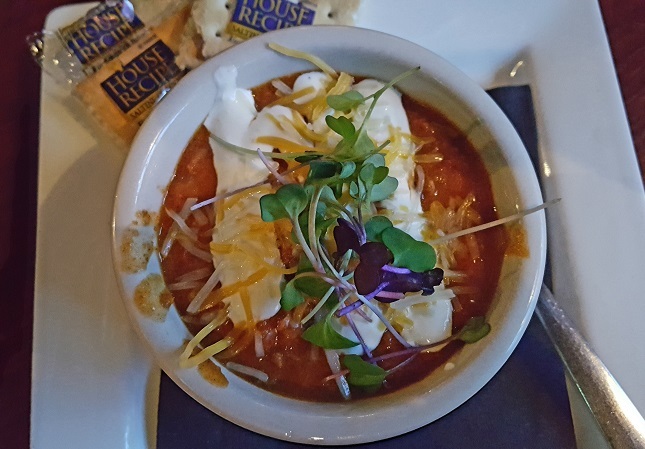 We decided on a cup of Chili and Fried Green Tomatoes for our two appetizers and were blown away at how tasty they both were! The Beef Chili was thick and had a smokey flavor to it as well as a nice kick. It's perfect for warming you up on a cool night. 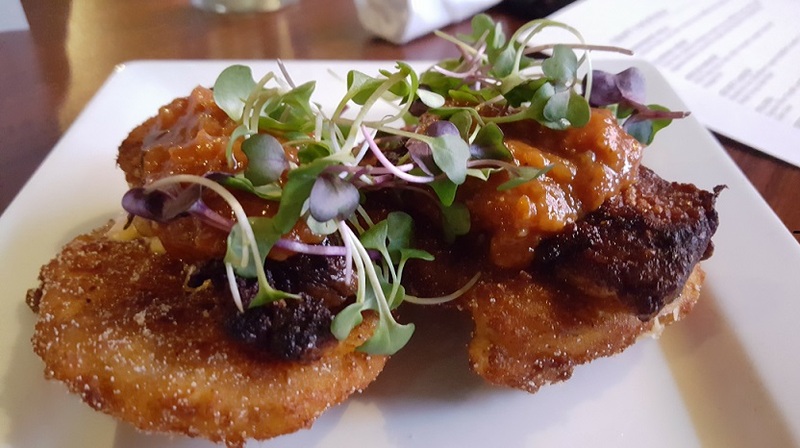 The Fried Green Tomatoes take it up a notch! They are each topped with Pork Belly, Pimento Cheese, and Homemade Tomato Chutney! Just WOW! For our main dish we had the Blackend Gulf Coast Shrimp & Cauliflower Grits (Gluten Free) and the Slow Braised Beef Cheeks! 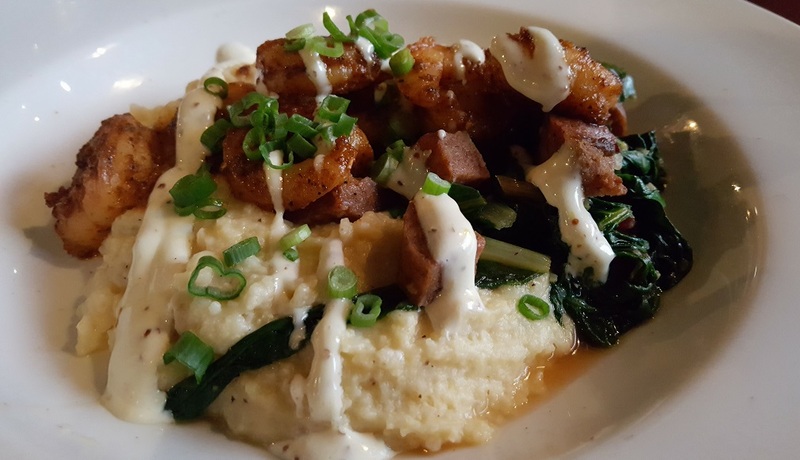 The Shrimp & Cauliflower Grits features delicious sautéed chard (greens), chopped andouille sausage, and a ground mustard cream to accompany the seasoned shrimp atop the grits. It's always great to have this many flavors on one plate! 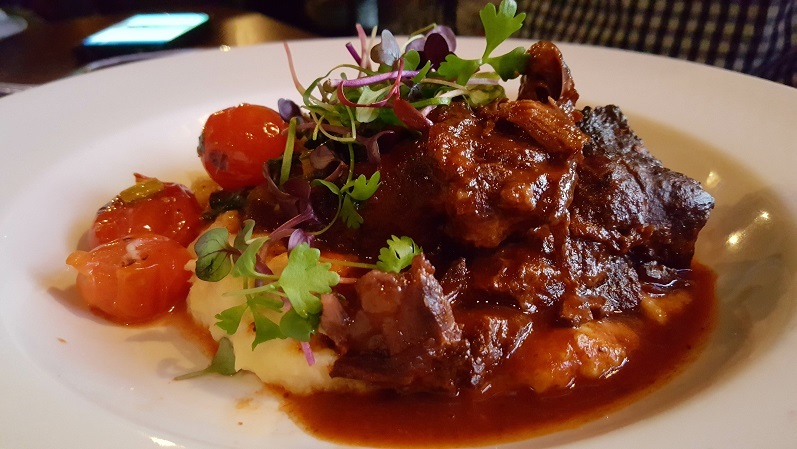 The Beef Cheeks were so tender that they fell apart as soon as the fork touched them! They were served on a Parmesan Parsnip Potato Puree (say THAT 3x fast!) and also had those flavorful chards. Both of these dishes were so good that we kept trading bites back and forth throughout the meal! It's worth noting that the portions are big enough that you will probably have some left to take home, especially after an appetizer. Be sure to leave room for dessert! Oh, dessert! We saved just enough room for some French Vanilla Bean Créme Brulee (Vegetarian/Gluten Free) and Salted Caramel Cheesecake (Vegetarian). 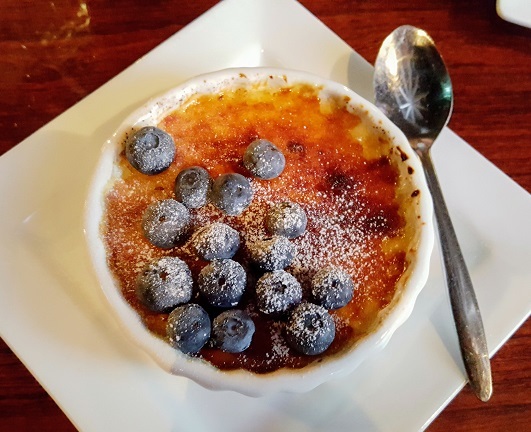 The brulee came topped with blueberries and a thin layer of hardened sugar. 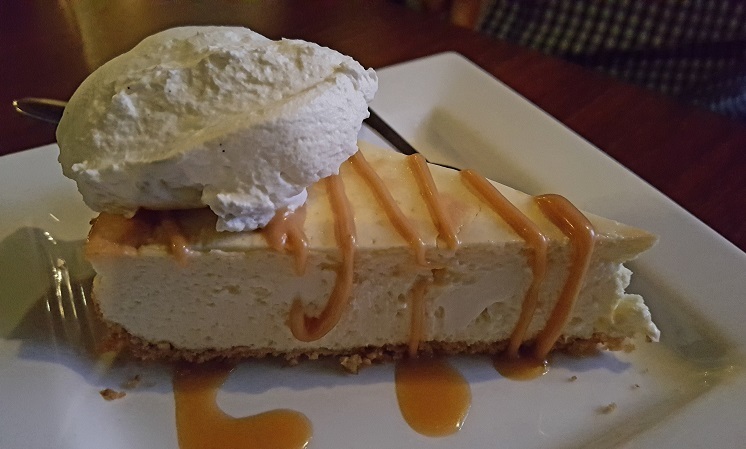 The Cheesecake was chilled and dense. It came drizzled with salted caramel sauce and has a light pretzel crust. By this point our appetites were beyond satisfied! 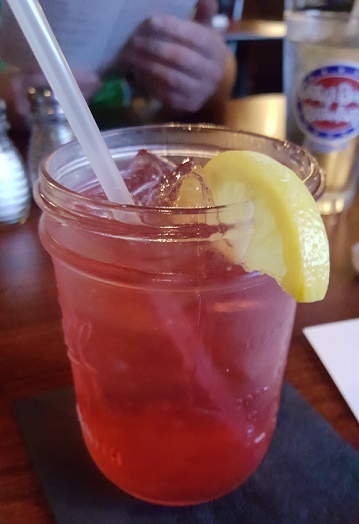 Oh, we also had a Honeysuckle Blue cocktail made with Cathead Honeysuckle Vodka and some blueberry syrup! 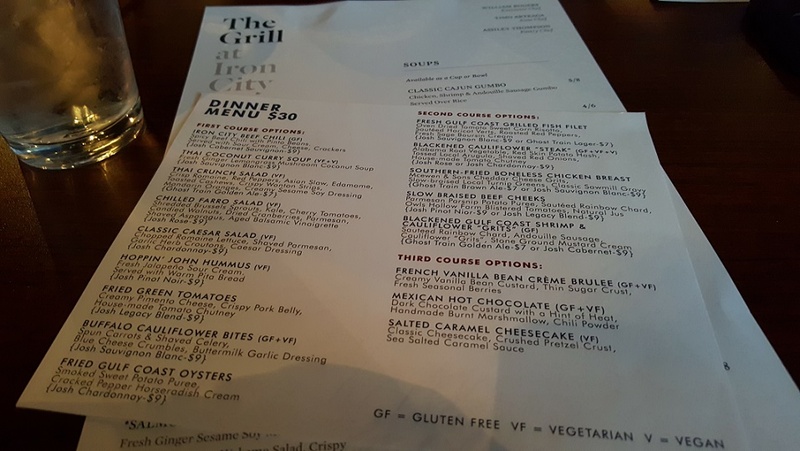 You may have notice a few extra notes in this review and that's because The Grill at Iron City offers Vegetarian, Gluten Free, and Vegan menu options! We know a lot of our followers will appreciate this. We also went on a Friday night which meant we were treated to live music by The Caged Birds. This was definitely and added bonus to our already fantastic dining experience! If you haven't guessed by now, we are HUGE fans of this particular Birmingham Restaurant Week menu. It has such a variety of top quality food to choose from! Be sure to stop in and try it for yourself. Tag any photos with #WRW2017 and let us know if you try something that we didn't. 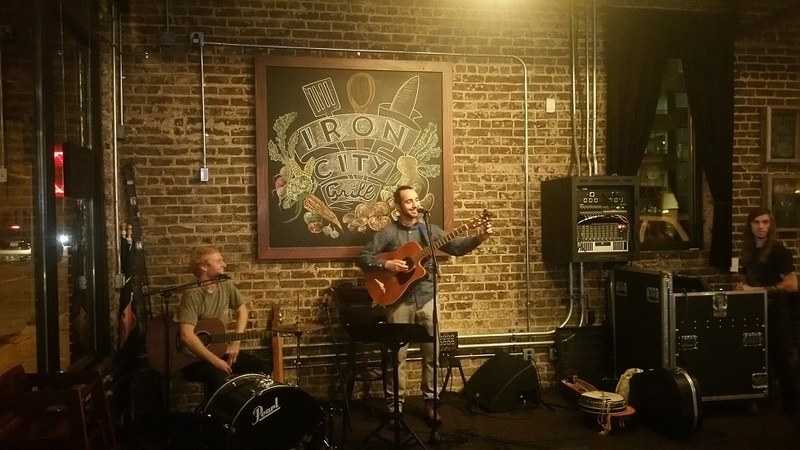 Remember, next time you are going to a show at Iron City be sure to treat yourself to a great meal at the Grill ahead of time!